Team Zombillies reviewed this attraction on October 27, 2017. 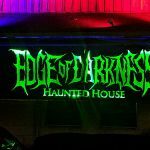 Edge of Darkness is an old-school haunted attraction located in Berea, Kentucky. This was our first visit to EoD and we were impressed with the amount of time we spent inside the attraction after seeing the small amount of space they had to work with. 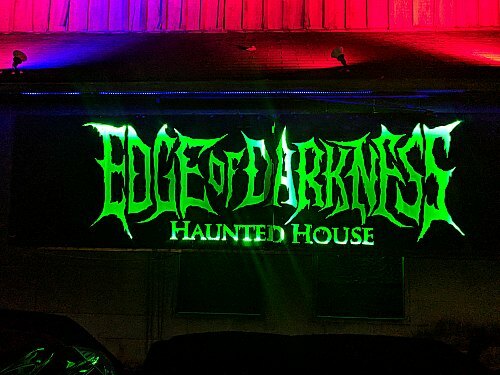 Besides their two main areas (the Haunted House and Maze, which are actually combined into one single attraction), EoD offers a few other unique activities that this review team hasn’t seen before, including their “Scare Cam” (which lets you scare other guests as they go through the haunt), two 30-minute escape rooms and the “Panic Room.” Of course, we can’t tell you what goes on inside the latter mini attraction, but we will tell you that we hope you don’t have a weak stomach! There were quite a few maniacs spread throughout both haunts. So much that they were waiting for us around just about every corner! This is definitely an actor-driven haunt and many of them seemed to have a ton of bottled-up energy, which helped them cover as much of their areas as possible. In the maze, we came across a group of mostly younger and playful characters. A lot of generic and similar dialogue was used, including “Come play with us,” and “Hi.” They knew their areas well, always popping out of places that we weren’t expecting, but their clown characters weren’t quite as developed as the torturers we found inside. Dialogue was mostly conversational, but if you’re easily freaked out by clowns, youngsters or both, then you’re gonna be in for some trouble as you make your way through this area of the haunt! Though, their lack of experience and intimidation may leave some things to be desired for the avid haunt enthusiast. The two most memorable characters in this area were the angry monkey and the chainsaw clown, as they were the most believable and vicious towards our group. The chainsaw-wielding clown outside even told us that he likes the smell of chainsaws because it sinks into the skins of his victims when he relentlessly stuck his 2-cycle weapon as close to us as he could… trying his best to make us as uncomfortable as possible. The costuming appeared to consist of a mixture of items that were both store bought and those that were distressed and created in-house. Makeup was minimal from what we could see, but each application matched the costume it was paired with. Some of the costumes were complete from head to toe, while others were mostly street clothes with just a mask or makeup to establish those characters’ looks. The masks inside the house stood out to us the most. We even noticed a few that we hadn’t seen used before and they were just as grungy and horrific as the scenes we encountered them in. 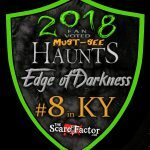 Of the complete costumes, the teddy bear, monkey, hillbilly and chainsaw aggressor who came running out at us near the end of the house were the most believable to our group. EoD is nearly impossible to miss. 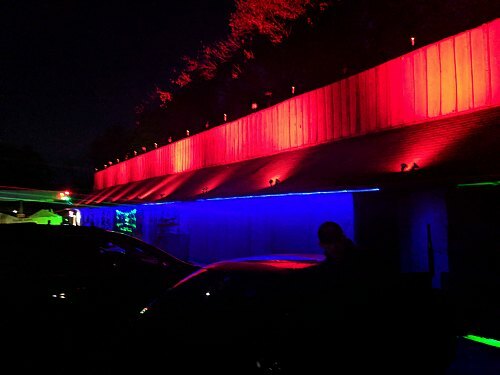 Our GPS took us right to them, it’s easy to spot the bright green “Edge of Darkness” sign and the front of the building is illuminated with colored lights. Parking, on the other hand, was a bit of a different story. Free parking is available right next to the building, but limited spots were available here and getting pulled into one of them can involve some tricky maneuvers within close proximity to the main road. Luckily, there was one spot left when we arrived, but we aren’t sure where customers coming in after us would park. There may have been additional parking nearby, but we were completely unaware of it, if so. 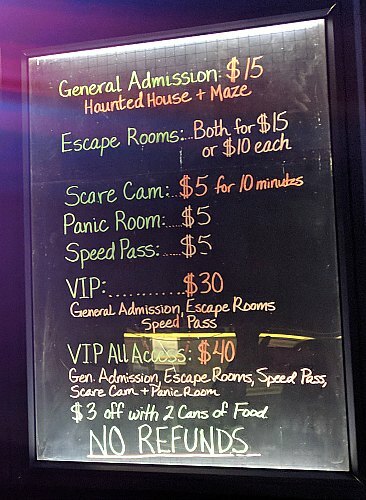 The ticket booth was very easy to spot with the neon “open” sign on it and concessions were available just in front of the escape room queues. A portable restroom was found behind the escape rooms in case you need to relieve yourself outside (instead of accidentally inside). Finding out where to go was pretty self-explanatory and plenty of friendly staff members were around to assist with any questions we had. Just talking to them let us know they take a lot of pride in this attraction and they are doing this for the love of it, which is always a good feeling before even going inside. Most of the haunt is easy and safe to get through, save for some strategically-placed obstacles that you’ll need to get around. A bit of uneven flooring was encountered inside and part of the haunt is outdoors, so be sure to dress accordingly. You may also have to crouch down and navigate a small slide. While we waited we did see two different chainsaw attackers going after victims in the waiting line so you might want to keep your eye out for those too! It appeared that the building might have been a roadside gas station at one time, but regardless of what it was, it’s obviously not that anymore! 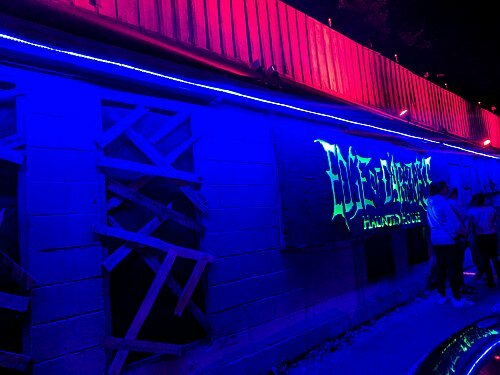 The multi-colored lights and large, custom-made “Edge of Darkness” sign on the front of the building was spotted well before we even pulled in! The building’s windows were boarded up, so it’s obvious they’re trying to keep some sort of evil from escaping! “Let the Bodies Hit the Floor” filled the air upon our arrival and they continued to play hard rock music to get customers going before entering. We know the chainsaw guy messing with those in the queue area was listening to the song because that’s what he was trying to do with his saw… let the bodies hit the floor! Watching him run around scaring guests before they went in really helped get us ready to go into a haunted house. We will also say that, if you decide to try out the Scare Cam experience, this will also help get you in the mood because, as you’re scaring people, you get to see their reactions via a live camera feed. When we saw the scares we could get with just the touch of a button, we couldn’t wait for our turn to be on the receiving end! EoD had a lot of old-school-style and custom effects. We saw a lot of things here that we haven’t seen before and if we had, we haven’t seen them all used in quite the same way. They told us they make the majority of what’s inside and some of it is downright disturbing looking! Some crazy human body art (scene decor) was found in several areas and we can’t imagine what else these folks can come up with! Many sound effects were heard and consisted of sounds and music we haven’t heard before. They were also used appropriately in many of the scenes and helped add a level of immersion that would’ve been otherwise unachievable. We heard some trippy sounds and wicked carnival music outside, as well as the many growls of a real chainsaw and, inside, we heard some vintage music and mystical sounds amongst many others. Lighting inside was used well, illuminating just enough for us to see the decor and detail in the scenes. We particularly enjoyed their unique take on the “pick a door” room as well as their swamp area, closet and maze path obstructions. Speaking of their maze, it should be noted that it’s made to be built and taken down each season. Because of that, it does lack the same intrinsic detail that we found in many of the indoor scenes. Though, it was still designed well and we did get turned around and hit some “dead” ends several times. We’re still unsure of how they managed to keep us in such a small area for such a long time! There isn’t an overarching theme that explains what you’ll see in each area of EoD. 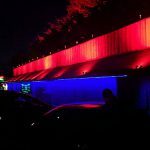 Though, it seemed the theme outside was a carnival, funhouse, freakshow-type of maze that offered many characters you would expect to see in such an area. Once inside, it felt like we went through the catacombs directly into the home of some sort of psychopathic killer who liked to string their victims up in unusual ways. Because we weren’t told of any overall storyline, nor did we see one on their website, we aren’t going to include a rating for this category. Multiple fright techniques were used against our group during our visit, including a few sneaky hiding spots that caught us by surprise. Several of these blended in so well with the scenery around them that we doubt we ever would have picked them off! If they manage to get your name, they will not hesitate to taunt you as they did us! Other than the hiding spots, the other type of fright we encountered the most here was some intimidating encounters, including the very close calls with chainsaws. Oh, and if you’re afraid of saws, you just might come running out of their exit! Edge of Darkness has many different ticketing options. 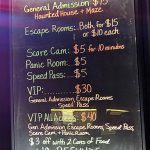 General admission for both the haunted house and maze is priced at $15.00 per victim. When just taking the haunts into consideration, our group’s tour time came out to 15 ½ minutes, putting their MPD (minutes per dollar) at 1.03. The average that we’ve seen in the past is 1.5, so they came in a bit below that. However, the tour time will likely vary per group because of the maze, so you may end up being trapped for a shorter or even longer period of time. If there is a large wait in line and you want to gain quicker access, RIP passes are offered for $30.00. You can also go all in and purchase the VIP All Access pass for a full evening of entertainment like we did for $40.00. This pass will grant you access to all of the above attractions with speed passes. We only did one escape room during our visit because we were pressed for time, but it was a good time and fairly difficult, yet not impossible to complete within the time frame. We chose the “Sacrifice” room, where one of us started out locked in a cell while the other was left to look for clues separately. 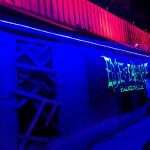 If you really enjoy escape rooms, we recommend trying out at least that one and we are sure the other room was just as unique. We did make it out but not without using some of our hints. Guests can receive $3.00 off with 2 donations of canned food. There is quite the variety of things to do for thrill seekers on this small piece of property. 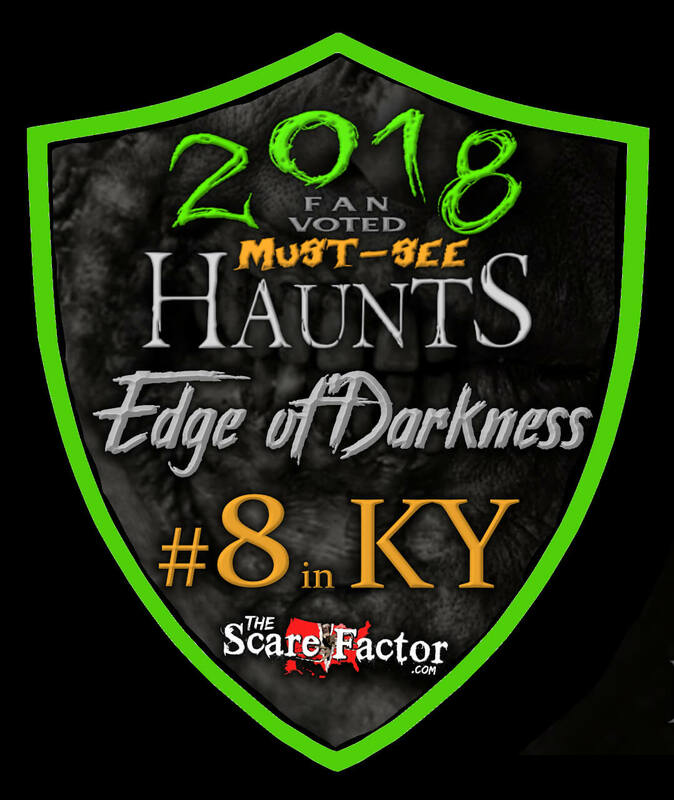 We came across some energetic acting, very friendly staff and some not-so-friendly aggressors that wanted to kill us, so if you find yourself near Berea, Kentucky this season, you might want to stop in to test your luck at escaping!